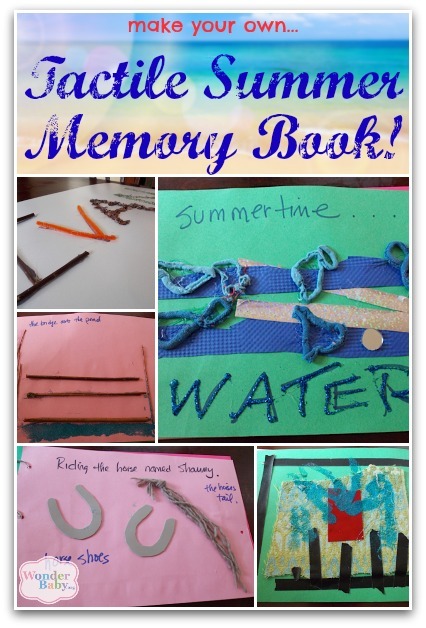 Tactile memory books are a fun way to incorporate language development, social skills and good old fashioned arts and crafts all into one activity. 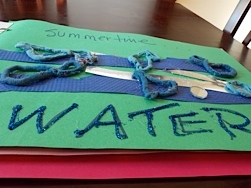 And tactile memory books about summer vacation are an easy way for your visually impaired child, verbal or nonverbal, to share with his class and teachers about his holiday when he gets back to school in the fall. 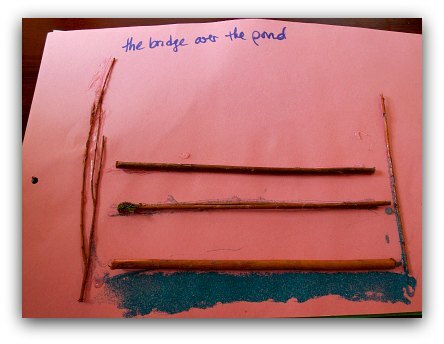 Before getting started, you might want to check out this site with ideas on how to make your own tactile books. Mostly they encourage the use of differing textures, high-contrast colors and non-cluttered pages. So start with a simple theme, like “My Summer Vacation,” then think of a few (maybe five) things you did this summer that will really stand out to your child. If you’re planning ahead, it’s fun to collect objects while you’re on vacation that can be used as materials for your pages later. Sit down with your child and talk about what you did over the summer break. Think about what was really fun or momentous. Pick out four or five big pieces of construction paper and talk about how you might “draw” those experiences using the craft materials you have on hand. A big part of creating a memory book is to talk about the memories while you make it. Even if your child is nonverbal, this is still an excellent opportunity to talk about time (past and present), family members and memories. A good first page might be to just draw your child’s name using tactile objects. 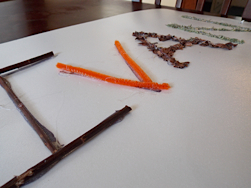 It can be fun to use summer objects that you’ve collected yourself. Go to the park or in your yard and find some twigs, pull up some grass or shred old leaves. Did you go to the beach over the break? Why not use sand to make one of your letters! Keep your pages limited and simple. Choose high contrasting colors for your paper and your materials and stick to one idea for each page. Finish each page with a title written in print and braille. It can also be fun to write the print words with puffy paint so they are tactile, too! To turn your pages into a real book, punch holes in your pages and hold the whole thing together with key rings. You can read your book together and talk about how much fun you had making it!